Well, we’ll soon find that out, thought the old queen. 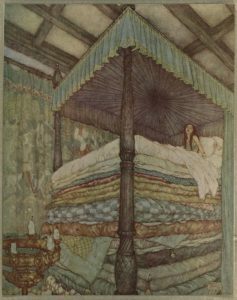 But she said nothing, went into the bed-room, took all the bedding off the bedstead, and laid a pea on the bottom; then she took twenty mattresses and laid them on the pea, and then twenty eider-down beds on top of the mattresses. Oh, very badly! said she. I have scarcely closed my eyes all night. Heaven only knows what was in the bed, but I was lying on something hard, so that I am black and blue all over my body. Its horrible!